This is the initiative of Flipkart started in 2014 for one day. This year Big Billion Days are for 5 continuous days starting oct 13th till oct 17th 2015. This sale is applicable on categories like electronics, mobile phones, laptops, large appliances, home,kitchen, furniture, small appliances, garden, safety instruments,food,beauty products and many more. Last year Flipkart’s Big Billion day offers saw sales of merchandise over Rs.600 crores in 10 hours of sale and the one-day flash sale was marred with technical and logistical glitches. Flipkart apologised to customers, acknowledging that their experience was less than pleasant. To ensure that sellers stock enough and deliver on time, the company is offering four outperforming sellers return flight tickets to Paris besides iPads for over a dozen star sellers. 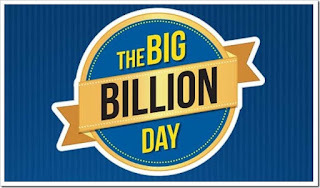 Unlike last year this year flipkart restricted big billion day offers only for app users. You need not worry about this as we have an app and you can download Encashit app and mark the dates in your calendar and wait for the day to shop through encashit app on flipkart app on big billion days and get upto 20% cashback. The cashback will be in the form of Flipkart Rewards. You can also earn extra cashback offers from banks using SBI, State bank debit card, CITI Bank cards and Standard chartered cards. In addition to these offers you can also earn more rewards from Encashit.com when you shop via our App. How to earn EXTRA CASHBACK during Flipkart Big Billion Days 2015? It is very simple to earn extra rewards on flipkart app only shopping. Just follow few easy steps below to make your shopping more exciting. Step 3: Tap on the big billion day offers and deals available on Encashit app or website. You will be redirected to Flipkart Mobile app directly. Step 4: Shop as usual on flipkart app. Sit back and relax, your cashback rewards will be added to encash wallet within 24hrs. Offers are going to be split into different categories each day. For example : 13th oct may be offers will be limited to electronics, 14th may be on mobiles next on fashion, followed by home, kitchen, furniture, books, kids wear etc. It will offer upto 80% off on mobiles. Most selling laptops will be starting rom Rs.15,000. On fashion you can get upto 75% off. On Electronics we can expect minimum of 60% off. Toys & Games may be with minimum 75% off. Also we can expect Exclusive mobiles with good discounts and offers. Last but not least One Plus products are also expected with huge discounts. We have got few top picks for you to focus on. The list below is just an expectation and we want you to be alert on picking these top deals available on Big Billion days. Lenovo K3 Note is back in stock for Rs.9,999/- only and it may drop its price by 5% more. Asus Zenfone 2 laser is available for Rs.9999/- and expected to drop by 5% more this Big Billion day with extra bank cashback offers from citi, standard chartered etc. The Flagship killer OnePlus One will be available at its ever low price on Flipkart’s Big Billion Day without any invite. You can grab this opportunity to own world’s most trending and wanted mobile oneplus one. This is the best category for Flipkart with the support of Myntra the largest fashion app in India. Also, maximum cashback offers available on this category from encashit app. We offer Flat 16% cashback on fashion for new users on flipkart and 12% cashback for old users on flipkart. By choosing encashit as your shopping companion you can earn more this Big Billion Day season without any hassle as we have App to App redirection feature for Flipkart shopping.